Play Diamond Mine Slot Online with 500 Free Spins! Diamond Mine is a UK Online Slot Game by Blueprint Gaming. This 7x8x8x8x8x7 layout slot game has an RTP of 96.43%%. Each spin can have up to 117649 ways to win! Payouts are multiplied by stake. Ride down the mine shaft in Diamond Mine online slot game as you blast away many chances to win real money that have you literally rocking. 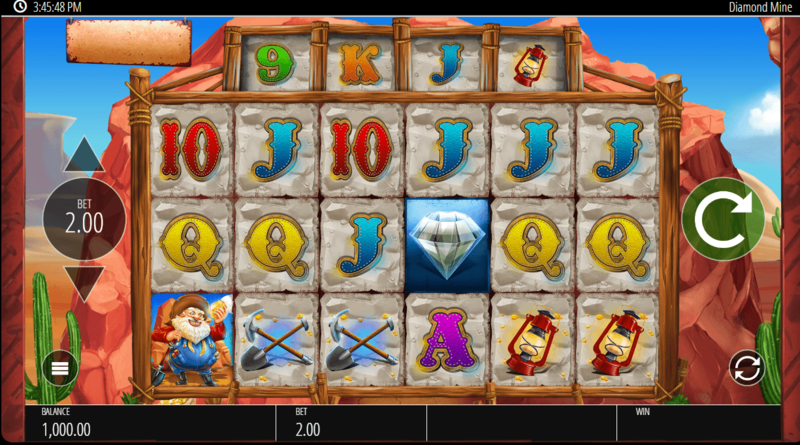 Transport yourself back to the old West in Diamond Mine slot game and into the time of gold (and diamond) fever. Baking under a blue sky in the background appears an arid Western desert with spikey cactus and the reels themselves are creatively set against a mountain of rock. The border to the reels is also supported by logs of lumber as in a mine shaft. High to medium value symbols include a diamond, a grey bearded miner holding a nugget of gold, an antique lantern, and a pick axe and shovel. There is also a TNT Wild and a sack of gold Scatter. Of lower value are standard Saloon playing cards A, K, Q, J, 10, and 9. The impressive graphics of Diamond Mine online slot are in a playful, somewhat comical, cartoon style and this is accompanied with fun animations. For example, the TNT exploding on the reel and rocks blasting away when winning combinations are formed will make you glad you wore a hardhat. The background soundtrack, with the clink of pick axes and neigh of pit ponies, immerses you and makes you feel as if you are at the mine site. However, upon spins, a more upbeat tune plays that lets you feel as if you have struck gold and are celebrating at the local saloon. This blends beautifully with the exploding sound effects and chimes upon wins. So take the Rose Slots mine train deep into the rock in Diamond Mine online and you could be carting out bundles of major payouts. You will soon be calling yourself a real ‘rock’ star. Sending you to the mine site in style in Diamond Mine slot is UK based online casino games designer Blueprint Gaming. Founded in 2001, Blueprint Gaming has established itself as a pioneer in developing top notch slots in the industry, with a particular focus on creating mobile friendly gameplay. Players of online casino UK will appreciate Blueprint Gaming titles for their innovative and immersive graphics, simple style of gameplay, and generous chances for major rewards. There are a wide-variety of other Blueprint Gaming slots to enjoy at RoseSlots.com such as ‘El Jackpotto’, ‘King Kong Cash’, ‘Wish Upon A Jackpot slot’, and ‘Ave Caesar slot game’. Mining is infamously grueling and dangerous work, however there is no risk of a cave-in or collapse in Diamond Mine online slot as gameplay is simple, fun, and easy to understand. With 6 reels, up to 7 wager rows (including a 6th top row from reels 2-5), and up to 117649 Megaways to win, you could really be ‘digging’ this slot game. The exciting set-up of Diamond Mine slot is the collapsing/cascading reels or ‘Reaction’ feature whereby any winning formation literally explodes from the reels allowing more symbols to fall into the empty space left behind. What this means is that you can enjoy multiple wins on only a single spin or bet. While there are up to 5 wager rows, each symbol can occupy a larger grid which thereby creates better odds at winning combinations. For instance, one symbol can take up 3 spaces in 1 block. The Wild TNT on reels 2, 3, 4, and 5, blasts away all other symbols, except the gold sack Scatter, to award winning combinations. There is also a mystery symbols barrel of TNT that can transform into any symbols except the Scatter. Find 6 diamonds in the rough and you will be glittering just as brightly with a 50x multiplier on your initial bet. This is followed by 6 of your grinning bearded work mate chipping out a 7.5x multiplier nugget. Wagering in Dimond Mine slot has a versatile range from 20p to £100. Keep in mind that upon every win, the collapsing reels reaction comes into play at the bet that you placed which could create major awards on only one spin. If it is break time from all the chipping, you can still keep drilling by setting the AutoPlay for 10 to 100 continuous spins. While deep in the mine you can even enjoy Diamond Mine online as it is fully compatible and nicely designed as a mobile slot as well as on other devices like desktop and tablet. With collapsing reels and a generous bonus round, the theoretical RTP (return to player) is estimated at 96.43%. The Bonus itself become somewhat easier to trigger given the nature of the Cascading reels reaction. For instance, a winning combination may explode on the reels yet the Scatter sacks of gold will remain for the next group of symbols to fall into the empty space left over. Among these new symbols could be more Scatters and therefore, after pairing up with the Scatters already on the reels, launch the exciting Bonus round. At least 4 sacks of gold Scatters on the top of the reels will trigger the Diamond Mine slot Bonus round and award you an exciting 12 Free Spins. You will be calling it a true ‘blast’. This is when you descend deeper into the mine shaft, where there are even greater chances to strike a gold jackpot with every swing of the pick axe. Even more thrilling is that only 1 extra Scatter on the base reels during the Bonus will re-trigger an additional 5 Free Spins. If 3 or 4 Scatters appear at the very top row you will be awarded an extra 5 or 10 Spins respectively. Further, the ‘Reaction’ or Collapsing reels feature gets even better as each win causes a multiplier increase on awards. This starts at 1x and goes up by 1x for every winning combination, thereby allowing higher rewards for each subsequent win. The cascading reaction reels themselves acts like Free Spins, and with an increasing multiplier and chance to re-trigger spins, there are many opportunities for generous payouts. The mystery symbol feature is also still in play, so that the reels can reveal identical winning symbols on the reels and, in turn, trigger again the exciting collapsing reaction and multiplier feature. Now that is what you can call ‘dynamite’.